Power Kite Forum - Any big wheel landboards out there? Author: Subject: Any big wheel landboards out there? 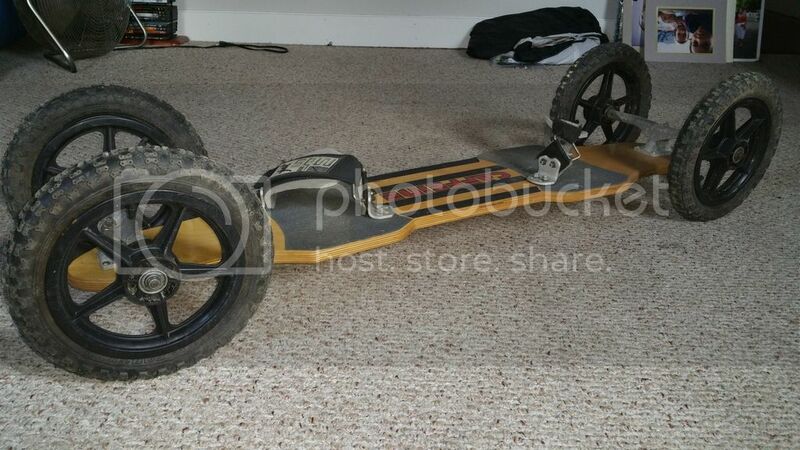 Any big wheel landboards out there? I'm a buggy pilot that wants to pick up a landboard that will ride on the beach and wind packed sand. 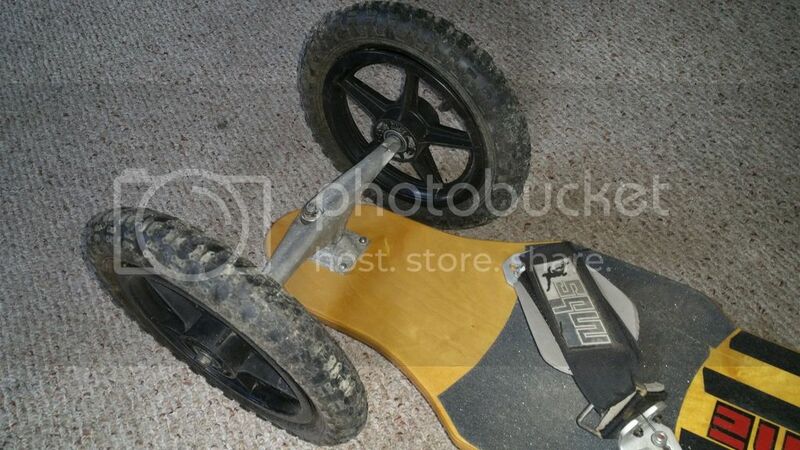 I think I am looking for 10 - 12 inch tires that fit hubs that will go on a standard landboard. I have not found much using web searches. What do beach riders use? I've seen (and tried) successful riding with 8" wheels on a well packed sand of Atlantic Beach, NY. I had much trouble trying to ride the same board on the softer sand last month at Plumb Beach. I'm not an engineer but it seems the physical dynamics, i.e. drag vs. force necessary to move, coupled with the area displaced topside i.e. the rider, it just wouldn't be fun! 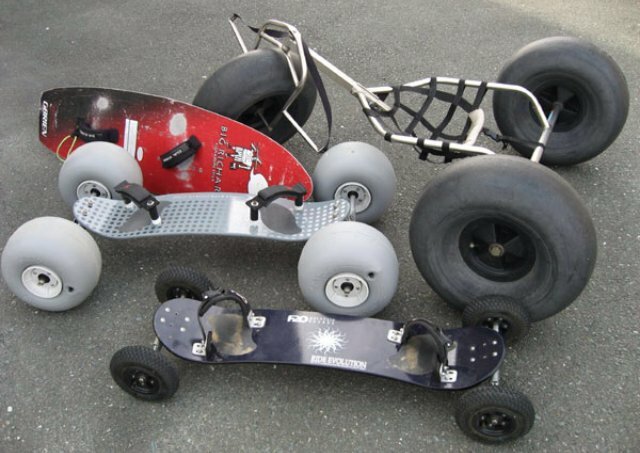 Flexboardz and MBS both have done the 9 inch wheels. It's hard enough to buggy in soft sand with bigfoots, on a board wouldn't be any fun to me. Not sure about anyone else but I prefer to reduce the Rolling resistance as much as possible, so that I can worry about having fun than worry about face planting. the 9" definitely give more soft terrain range. in general land board riding is considerably more edging than rolling and this is the real issue. so in soft you have to keep the kite high, and a light touch "on top " of the board than ride edge heavy. 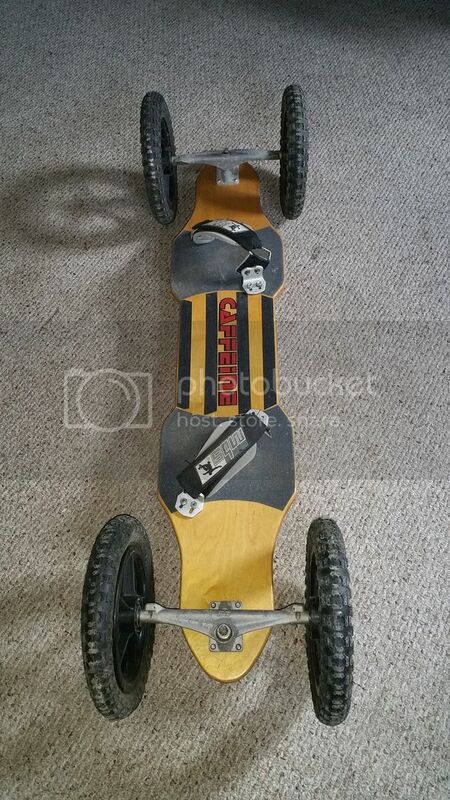 flexboard (wide axle) has plenty of float over soft and is much better design for "on top" riding. alot of powdery soft is very difficult in general and step in width and height is the solution, 10"x 4" is about as big as u can go and still have some type of control . Looks like I'm going to go for the MBS Core 94 because of the 12 millimeter axles and new hubs that will take the nine inch wheels. They have also upgraded the bindings. The hubs should take 10 inch tires when I am ready. Thank you to those who have given me information and help me. 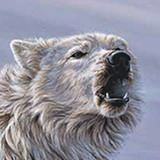 have a look at this thread. plummet in NZ uses granny tires on homemade revo trucks. They say revo trucks can be found on kitecrowd occasionally. Plummet says he is the only one in the world that rides dunes that he's aware of. maybe you could be second. How 'bout something like this..? Those wheels are 121/2". I don't know if there's any plus or minuses I haven't ridden it. Yeah, it's mine. Really foolish impulse purchase from a long time ago, when I had disposable income. Bought it knowing I would probably never ride it, just because it looked cool. I will say that I rode a few hills with it and like the lower cog. But I cannot compare it to anything as I've never ridden a board before. I am tempted to give boarding a shot now that I pulled it out. Narrow tires even 12 1/2" would still sink in soft sand. Sam, you never cease to amaze me. So while the decks are very similar, this deck was actually handmade by forum user Secondwind/Davinch out of Guam. It cuts about 10 lbs off the weight of the quadrolution. Pretty wild design. Does anybody have any thoughts on how it would turn with the board being UNDER the trucks as compared to above them? This design would certainly lower the COG. That one in the middle with grey wheels is built in Japan, IIRC but costs a bomb -- $1200. The tyres themselves are only $80 each. But that's the best for soft sand; seen it used here too and it just glides every where. Can drop the price a bit by buying them in units of two. Could probably DIY yourself for considerably cheaper than 1200. Biggest hurdles would be axle width/tire bite and stepping down the bearing size. Other options are "granny/mobility tires" like Plummet or DuroTraps. Removed the 8 inch T3 wheels that came on my Core 94 and replaced them with 10 inch wheels. Tires are from Harbor Freight (410x350) with new tubes. Cost of new tires and tubes was about $40 total. Have not had a chance to try it on the beach yet. There is an 8 inch tire in the picture to compare size. Looks like a big improvement. I can't believe I didn't think of trying that when I had a landboard. Nice job. You end up changing out the bearings I assume, or is the Core not a 12mm axle like my Comp is? Core 94 is a 12mm axle. Used the new hubs that came on the board for the bigger tires. Just changed tubes and tires. The new 10 inch tires are probably not very good for high speed as they may be a little out of balance but should be good for this old man on the sand. I am a kiteboarder/buggy pilot just getting into ATB riding. After looking a the Cheeses tall and skinny wheeled board, I think I can use the taller and skinnier wheels on my MBS Comp 95 board to help it roll through the grass much faster. I found them here. http://www.amazon.com/gp/product/B0000AXD9Y/ref=ox_sc_act_ti... They would cost $66 after shipping. They have 1/2" ID bearings in them and I have 12mm axles on the Matrix trucks. The axles would be a little undersized and have 0.028" of slop, but I think that would be OK.
As for wide tire solutions, someone mentioned go-kart tires. If you have a local indoor track they may give you used sets for free. I don't know if they would fit on standard mountain board rims. Ah. I was thinking you'd removed the wheels and used the Harbor Freight tires with the cheap hubs they often come with, and not just swapped the tires onto the old wheels. fast_monte, you probably can punch out the bearings in the wheel and replace with a 12mm bearing. I bought one of the 10" Harbor Freight tires, they are on sale for $5.99. I compared them to the 9" tires that came on my MBS Comp 95X and have decided there was not enough of a difference to go through all the hassle to change them out. I live less than a mile away from the store, so I will be returning the wheel. If I had the 8" wheels I would upgrade. did you have to come up w/ a 10" tube and a 90d offset on the valves?? ?